Welcome to Charlotte247RealEstate.com, your best resource for buying or selling real estate around the Charlotte North Carolina Metro Areas & Surrounding Counties, including parts of South Carolina. We have the best selections of real estate & homes available daily. Charlotte247RealEstate.com is designed to be innovative, educational, fast-loading and easy to navigate. So whether you're looking to relocate to the Charlotte, NC Area, or are just ready for a change, Charlotte247RealEstate.com is your one-stop site for all of your real estate needs. What are your Real Estate goals ? We will work with you to define your personal real estate goals and put a plan in place to achieve them. We have all of the resources and years of experience to get you to the closing table. Are you are looking to buy or sell a home, townhome, condo, land, farm, or commercial property in or around the Charlotte Metro Area? Considering Uptown Charlotte, South Park, Ballantyne, Lake Norman, Lake Wylie, Weddington, Matthews, Waxhaw, Wesley Chapel, Indian Trail ,Fort Mill, Indian Land, or many of the surrounding areas ? if yes, then you have come to the right place. Here you will find a wide variety of information about local real estate for sale. We have many easy ways to search for real estate. You can search for homes and land by, County Search or Communities. The best way to search is to use our Advanced Search, which allows you to create a custom search, allowing you to choose specific property types, acreage requirements, schools, condo & land options, foreclosures, short sales and many other custom real estate search features. The advance search also has a Search by Map option. Looking to sell your home ? 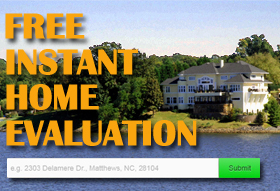 Get a Quick Property Evaluation Value in 1 min or less. Whether you are looking for land to build with a custom builder or looking for hunting and fishing land, farm land, we have the most up to date inventory. Real Estate Investors can also find multi-family investment properties, commercial, industrial and retail real estate. Make sure you see our Daily Email Alerts of new Charlotte NC & Surrounding Counties real estate listings; you will receive email alerts daily of any new homes, land or real estate listings that just hit the market matching your search criteria. You can also save multiple searches to revisit or track your favorite real estate listings. You will have complete access to your account and can change the email alerts at anytime and can even share them with others. Trouble finding the perfect Real Estate matches ? If you can NOT find what you are looking for please contact us for off the grid properties or we can provide a different search option. Simply tell us what you are looking for such as, you need a mother-in-law suite, in-ground swimming pool, disability access, fenced in yard, gated community, outbuildings or a hard to find waterfront property for your home, etc. Need to get pre-approved for a home loan ? Do you plan on buying a foreclosure fixer-upper or luxury home, need a construction loan to build your dream home, or financing options to secure a building lot or land? Do you have to repair your credit, or find out how much home buying power you can afford? 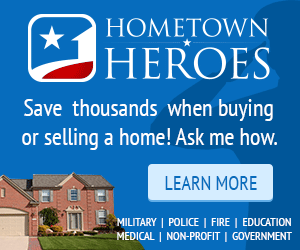 Do you need to buy a home with no money down or would like to take advantage of home buying assistance programs? We can help. Our preferred lenders offer very competitive rates and programs to help achieve your real estate goals. They can pre-qualify you for a home loan in around 10-20 minutes.